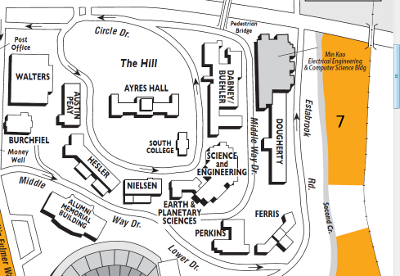 Our lab is located on the 4th floor of the Min H. Kao Electrical Engineering and Computer Science Building on the Knoxville campus. Keep right and follow signs for US-441S/Henley St.
Keep right and follow signs for TN-62/Western Ave/Summit Hill Dr. Remain in center lane. Continue straight through the stoplight onto 11th St. Turn left onto Cumberland Avenue, and stay in right lane. Take immediate right into the S7 lot. Remain on I-40E and follow directions below. Take Exit 388 - US-441/South Henley Street. Keep right to take the TN-62/Western Ave. ramp toward Summit Hill Dr. Remain in center lane. Take Exit 387 - 17th Street/Western Avenue. Keep right to merge onto 17th Street. Turn right onto Western Avenue. Turn right onto 11th Street. Turn left onto Cumberland Avenue, and stay in right lane for approximately 0.5 miles. Visitors to the Power IT Lab can park in the S7 lot, which is across Second Creek from the Min Kao Building. A special pass is needed. Please be sure to ask us for the pass when you arrive.